TOKYO – Nikon Corporation's D3100 digital-SLR camera, recipient of the iF Product Design Award 2011, is also a recipient of the iF Communication Design Award 2011. The iF Design Awards are globally prestigious awards sponsored by International Forum Design GmbH of Hanover Germany. As recipient of two prestigious iF awards in 2011, the Nikon D3100 has proven its superior design. 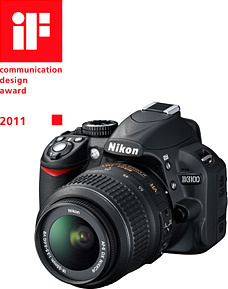 Nikon entered the D3100 in the iF Communication Design Award's Product Interfaces category. The D3100's GUI was designed for simple operation that can be quickly mastered by even first-time users of a digital-SLR camera, and its major feature is the Guide Mode menus that allow users to gradually increase their photographic knowledge and skill. The camera won the iF Communication Design Award based on the usability, look and feel, and uniqueness of its interface. Six independent and equally important design awards, collectively known as the iF Design Awards, have been sponsored by International Forum Design(iF) based in Hanover Germany, since 1953. Each year, industrial products exhibiting superior design from around the world are selected as recipients of these prestigious awards, among them the Product Design Awards, Communication Design Awards and Packaging Awards. This year, 861 products from 27 countries were entered in the contest for the iF Communication Design Awards 2011. 231 products, including the D3100, received the award. This year's awards ceremony is scheduled to be held on March 18th (Friday) at BMW Welt in Munich. The D3100 (released in September 2010) is an entry level digital-SLR camera equipped with a new DX-format CMOS image sensor with an effective pixel count of 14.2-million pixels and the new image-processing engine, EXPEED 2, both developed by Nikon, that enables the capture of high-definition images with superior image quality. The D3100 is equipped with a Guide Mode function with operation simple enough for even first-time users of a digital-SLR camera. Guide Mode utilizes an intuitive GUI design comprised of selectable menu items and assist images. The camera also offers a number of convenient functions, including live view mode for framing photos using the built-in monitor, as well as the D-Movie function, which supports recording of full-HD movies. Despite its compact size and light weight, the D3100 offers the authentic performance of a digital-SLR camera, allowing users to capture beautiful photos that reflect their individual intent with simple operation.